Circa 1975 I gave away my 3-year old Renault 12 Canadian-made car and have either used a bicycle or gone on foot ever since. Most people are not willing to go that far to cut their greenhouse gas footprint. They don’t have the money for a new Tesla electric sports car or Prius hybrid car, or maybe not even enough for a fuel efficient diesel Smart Car. 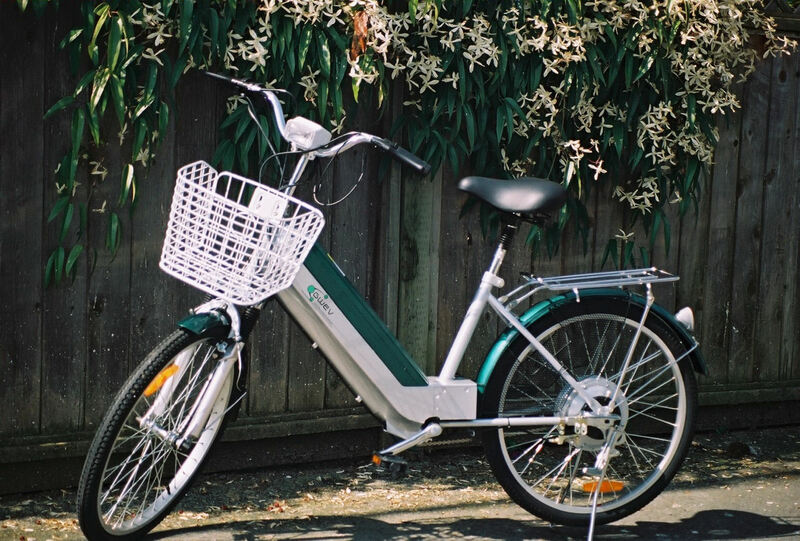 There is yet another option — an electric-assisted bicycle. My roommate just bought one on 2008-04-19, a low cost 250 watt 36 volt Jinhua Luyuan Electric model from GWEV (Green World Electric Vehicles), similar to the one in the picture. Most models are twice as powerful. Of course, I got to ride it. Click the camera icon for a larger image. The bike is much heavier than a regular bike (about 27.22 kg (60 lbs)) because of the lead-acid gel batteries. However, unlike a motorcycle or scooter, it offers little resistance to being walked along. Because of its weight, when you turn off the electric assist, it feels a bit like riding a tandem bike. When you turn it on, it is like having an eager strong pedaler on the back of your tandem who gives you a big boost when you are accelerating from a stop, or when you are climbing a hill. Otherwise, it is pretty much as if the assist is not there. You pedal all the time. It gives you illusion of being fitter than you are. You just zip along like a teenager. This is not a scooter, where you sit passively. I got used to it very quickly. It made be feel a lot safer at intersections to be able to accelerate and get through them so quickly. The biggest downside is the difficulty maneuvering the bike indoors. It is heavy and if you get it even a little off balance, there is no way you can hold it from falling over. I once made the mistake of trying to take it down some cement stairs. I quickly found myself unable to control the bike and was soon stuck pinned under it until a passeryby rescued me. The reason I have the bike is my room mate found it too unweildy to maneuver and I inherited it. After six years the battery is losing its ability to hold a full charge. I must recharge after every trip, or I end up pedalling without electric assist, an onerous task given the weight of the bike. However, I cannot find any place that stocks a replacement battery. The original dealer has gone out of business. It comes with a complicated bike poncho that covers you, your legs and much of the bike for riding in the rain. It has special holes for the mirrors and a clear panel for the light. With its massive gel cells, it comes with integrated lights. This model has a 250 watt motor. A professional cyclist, on the back of your tandem could pump out about 775 watts, but then they would add an additional dead weight of perhaps 175 pounds, considerably more than your battery pack. A recreational cyclist would do well to sustain 150 watts. The bike has a rated range of 30 km (18.64 miles) More expensive models are in the range of 80 km (49.71 miles). I would expect it depends just how much you use the assist. You plug the bike into the wall to charge any time it is not in use and the charger automatically shuts off when the cells are fully charged. This one is fitted with a large front carrying basket and two detachable saddle bags in the rear. Its main function will be fetching groceries. The bike has derailleur gears, like a standard bike. These are purely for human power when the battery is dead. The electric motor bypasses them. You don’t need them much since motor gives you such a boost at slow speeds. You could easily leave the bike in high gear all the time. Electric motors have great torque and acceleration at low speeds. each, there is zero risk of jail time. In contrast, electric bike theft is considered a form of car theft with jail time. There are no quick release components to tempt thieves. Joyriders can’t do anything without the key and such a bike is a bit of a klunker, less fun than a standard bike for speed. Integration of specialised components make them worthless on the resale market. The bike is distinctive and hence harder to resell discreetly. There are not that many electric bikes sold legitimately. They tend to klunky styling, perhaps designed to appear to older people, which again discourages theft. Other models look more like tiny motorcycles or scooters. It’s fun to pass a long line of cars by zipping along the bike lane. It is fun to seriously out-accelerate the cars at an intersection. That you can do that might come as a surprise. Newton discovered that acceleration = force / mass . This means you can double the acceleration by doubling the torque of your engine or by cutting your vehicle’s gross weight in half. An electric bike weighs a tiny fraction of a car, hence runs circles around it in acceleration. Most modern bikes use lithium batteries. They cost over ten times as much as lead-acid batteries but the are much lighter, they last longer, charge five times faster, and don’t fade. Ebike batteries are usually rated 10 or 15 amp-hours. Lead acid batteries only deliver about 2/3 of their rated capacity. They are not particulary well suited to deep discharge eBike applications. By comparison, an AA size dry cell has a capacity of about 2 amp-hours. Automotive car batteries are about 50 amp-hours. A higher voltage setup needs proportionately fewer amp-hours to deliver the same range. It is not the sort of thing that turns heads like an electric sports car, though some kids did mention how cool the bike was as I rode past on its inaugural run. Any time a stop at a light, the odds are very good someone else standing there will start asking me questions about the bike. It is great conversation starter. Half the exercise of cycling comes from the muscles used for balance. You might find yourself getting even more exercise than with a regular bike, if you got in the habit of using it for commuting and errands. This is nothing like a motorcycle. You won’t be doing wheelies with it.